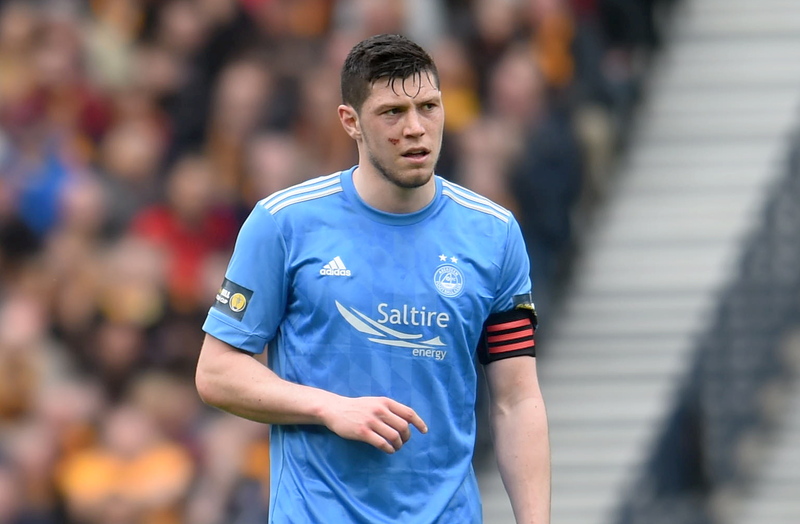 Scott McKenna captained Aberdeen for the first time in last year's semi-final against Motherwell. Against Motherwell in last year’s Scottish Cup semi-final, McKenna added to his rapidly expanding CV by leading his team out at Hampden Park. 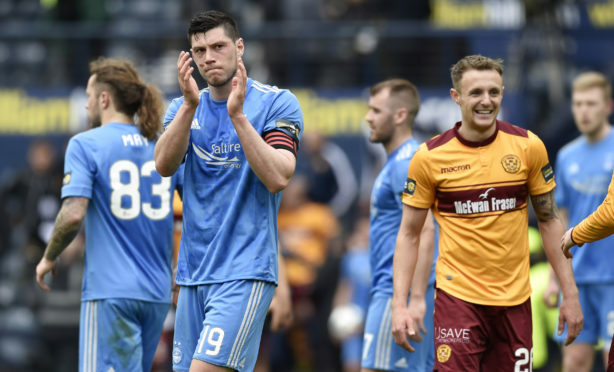 What followed was a bruising, humbling demolition at the hands of the Steelmen, whose 3-0 win prompted some serious soul-searching within the Aberdeen dressing room. Again without Graeme Shinnie, plus injured defender Shay Logan, the Dons must travel to Hampden and this time slay Celtic, who have already beaten Derek McInnes’ side in the Betfred Cup final this season. McKenna said: “The Motherwell one was a lot worse than the cup final because we were probably expected to win that game and we let ourselves down on the day. “Being named captain that day was a special moment for me and it didn’t turn out the way I wanted it to. 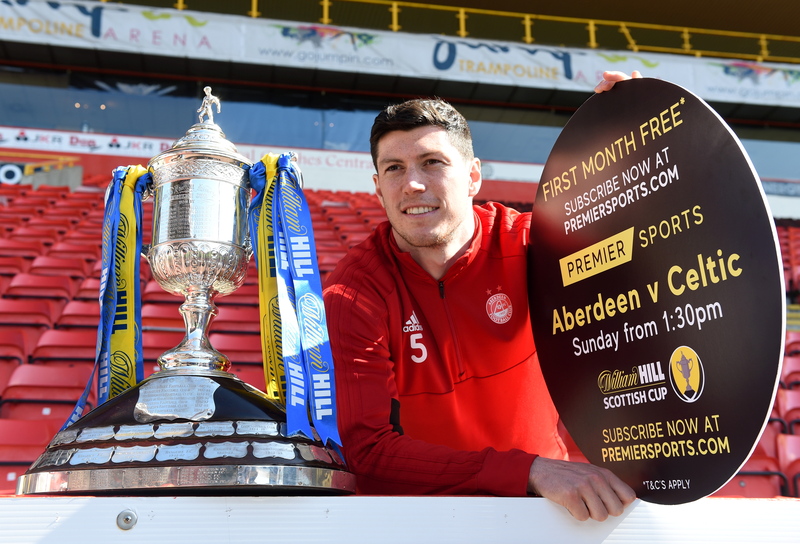 Scott McKenna will captain Aberdeen again on Sunday. “In the final against Celtic we gave a really good account of ourselves and ran them close, it wasn’t like we were beaten comfortably. We had chances to take it to extra-time. “Obviously to lose any cup final is not a great feeling and hopefully I won’t go through it again, but the Motherwell one was more disappointing. McKenna is used to coming up against Scottish football’s wind-up merchants. He has enjoyed a season-long rivalry with Alfredo Morelos, in which the Rangers striker has been sent off twice for altercations with McKenna and picked up another for clashing with Shinnie at Ibrox. Morelos lost his cool again in the Old Firm derby against Celtic, picking up his fifth red card of the season. Celtic skipper Scott Brown was on the receiving end of an elbow from Morelos, as well as Ryan Kent raising a hand to his face and Andy Halliday confronting him at full-time. He said: “I actually tried to wind him (Morelos) up by having a little niggle, but I didn’t realise how raised my leg was. It was up near his head so I couldn’t argue with that. It’s up to me to remain calm in those situations, even when they are trying to wind me up. “You can try and wind your opponent up but you can’t let it get the better of you, like I did when I reacted against Rangers. If they are going to have a nibble back at you then you have to try and let it slide. It’s all part of the game, but I will learn from that and hopefully it doesn’t happen again. The 22-year-old has become one of the most talked about figures in Scottish football over the last 18 months, given his rise from relative obscurity to Scotland international. Multiple rejected bids, from Celtic, Hull and Aston Villa, show he must be doing something right, but he does not bat an eyelid to his own increasing stock. He said: “As much as it is nice to have people talking about you and putting offers in for you when nothing happens there is nothing to be talked about. You have to forget about it. “I am quite hard on myself if it’s my fault. I try my best every game but when I do something like kick out and get a three-game ban then that’s my own fault, I can’t blame anyone else. That annoys me.